Be sure to buff your balls… bowling balls, that is, and get ready for some little-known facts about the Farrelly brothers’ 1996 comedy, Kingpin. 1. WOODY HARRELSON WAS ONCE PETER FARRELLY’S ROOMMATE. The pair lived together for four years while Harrelson filmed Cheers. 2. HARRELSON WAS A TERRIBLE BOWLER. And we mean terrible. His bowling was so bad that bowling coaches were brought in to teach him how to look believable just throwing the ball down the lane. Because of this, stand-ins were used for most of the shots of Roy bowling. 3. BUT HE WAS COMMITTED TO LOOKING THE PART. Harrelson shaved his head and grew an actual comb over to play Roy, but he wouldn’t go so far as to put on weight—the beer belly he sports in the movie was a fake. 4. CHRIS FARLEY WAS ORIGINALLY SUPPOSED TO PLAY ISHMAEL. He had to drop out because he had contractually committed to Black Sheep. 5. RANDY QUAID CONVINCED BILL MURRAY TO APPEAR IN THE MOVIE. Murray initially passed on the part of Big Ern; his friend Randy Quaid, who was cast as Ishmael after Farley dropped out, ultimately talked him into taking the role. Murray agreed to be in the movie only two weeks before shooting began. 6. BILL MURRAY IMPROVISED NEARLY ALL OF HIS LINES. He’d speak with the directors about what they wanted to achieve in the scene, then change his lines with each take. 7. 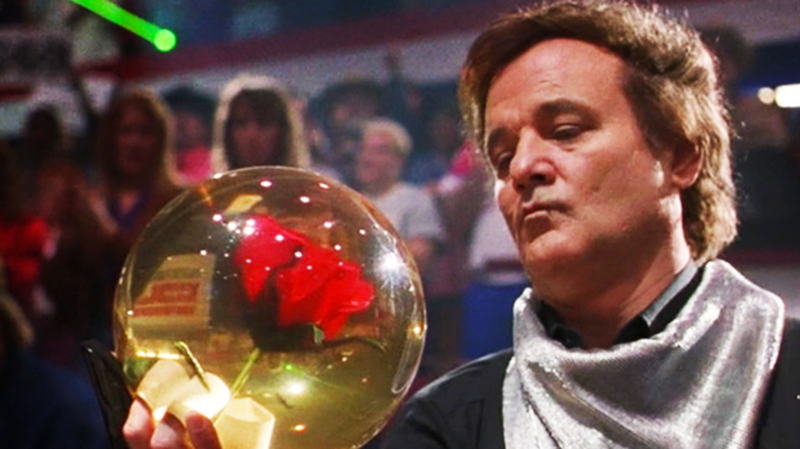 BIG ERN’S ICONIC ROSE BOWLING BALL WAS BOUGHT AT A PITTSBURGH PRO SHOP. The filmmakers found it while shooting on location—no changes needed. 8. BILL MURRAY ACTUALLY BOWLED THE THREE TOURNAMENT-WINNING STRIKES. Murray got lucky and made the three final strikes Ern needed to win. 9. LIN SHAYE SHOWED UP TO HER AUDITION IN CHARACTER AS THE LANDLADY. She was so convincing that people thought she was a homeless person, and the costume she wore to her audition was used in the final movie. Shaye previously appeared in Dumb & Dumber as the dog owner Mrs. Neugeboren, and would go on to appear in the Farrellys’ next movie, There’s Something About Mary, as Mary’s perpetually tanned roommate Magda. 10. PAUL SIMON WAS A FAN OF THE BLACKMAIL SCENE. 11. THE FARRELLYS DIDN’T HOLD CASTING CALLS FOR THE NON-SPEAKING ROLES. Instead, they simply hired their friends. 12. THE 1986 MOVIE SOMETHING WILD INSPIRED KINGPIN’S AESTHETIC. The Farrelly brothers liked the cinematography in Jonathan Demme’s road movie so much that they told their own cinematographer to copy its style. 13. THE MOVIE IS FULL OF CAMEOS BY PRO ATHLETES. Legendary Major League Baseball pitcher Roger Clemens makes a cameo as the biker Skidmark. Pro golfers Billy Andrade and Brad Faxon also make appearances, as members of the crowd in the opening bowling scene. Roy also defeats pro-bowlers Mark Roth and Randy Pedersen in the final bowling tournament. 14. THE FARRELLY BROTHERS INCORPORATED THEIR LOVE OF BLUES TRAVELER. John Popper, the band’s lead singer, plays the announcer at the final bowling tournament, and the whole band—dressed in Amish garb—play a song over the closing credits. 15. IT SHARES A CREW MEMBER WITH ANOTHER ‘90S BOWLING MOVIE MADE BY BROTHERS. Costume designer Mary Zophres worked on both Kingpin and The Big Lebowski.